How did we manage without… email? It’s hard to believe that when I started my business 21 years ago email did not exist in the average workplace. If we wanted to send written communication we either had to use the post or send a fax. Do you remember those? In 1992 when I started most faxes operated with thermal imaging paper.on a roll. Put a hot cup of coffee on the paper and there would be a black ring where the cup had stood. Keep the document for any length of time and it would have faded to such an extent as to become unreadable. The advent of the plain paper fax was progress! One of the problems with the fax machine was the lack of confidentiality. 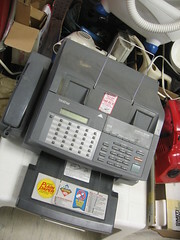 Most offices shared fax machines between departments. We could never be sure when a document would come in and who would be the first to pick it up from the fax machine. Including a top sheet marked confidential was hardly secured the information. Email transformed our lives! We could send written communication to a named individual instantaneously. As email systems developed we could attach other documents to our correspondence, we could check delivery and obtain read receipts. At first email was exciting. It was like getting a letter (not a brown envelope) on the doormat. For the home based small business owner it was contact with the outside world. Email allowed us to progress work quickly, to keep a record and an audit trail. It allowed us to communicate with customers and prospects easily and more cheaply. We could communicate across the globe within minutes where an Internet connection existed. I think email made us lazy. It became easier to dash off a quick email rather than pick up the phone or walk to the other end of the office with a message. Email introduced a tyranny of its own. We felt we had to open each new email the minute it arrived. Correspondents would expect instant replies. Email strained our time management to breaking point. I don’t know about you but much as I value email I find it hugely difficult to manage my inbox. In a typical day I might get 200 emails. I delete spam immediately but the inbox grows inexorably. After each major clear out I vow not to let it get out of control again but I guess I’m just not ruthless enough. I’m a learning junkie so anything that gives me information tends to get kept until I have time to read it. Anything I’m not sure how to deal with is kept whilst I prevaricate. Anything I might need as evidence tends to be kept just in case. I am getting better at moving things out of the inbox and into folders but it’s not always easy to find the time. It’s time to be ruthless. Would I want to go back to a time without emails? Certainly not. However I have adopted a more ruthless approach to their management. If I have a big project I only check them two or three times in the day and never first thing. I am trying hard to retain control of my time and not to respond to urgent pleas from senders unless it is vital to the relationship I have with them or I have the flexibility in my diary. I have unsubscribed from numerous lists and am purging my inbox on a more regular basis. What about you? How has email transformed your working life? Have you seized opportunities that would not have been available to you without email? I’d love to hear your views in the comment box below.. This entry was posted in Business development, Small business advice and tagged Business, Communication, Email, Email address, Gmail, Marketing, Services, Time management by glendashawley. Bookmark the permalink.